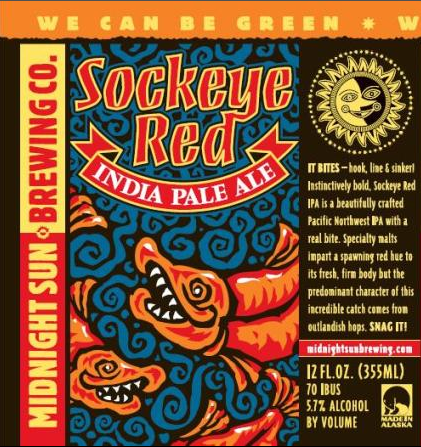 From Midnight Sun – Brewed in the bold spirit of Alaska, Sockeye Red IPA is a finely crafted Pacific Northwest-style India Pale Ale with a real bite. Ample pale two-row malt creates a fresh, firm body while specialty malts impart a spawning red hue. The predominant character of this fiesty catch comes from outlandish portions of Centennial, Cascade and Simcoe hops, giving this beer tremendous citrus and floral aroma and flavor. 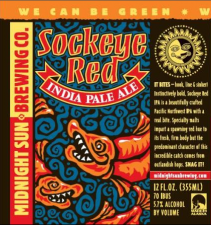 Midnight Sun Brewing – Midnight Sun Sockeye Red IPA – 12 oz. can poured into a goblet. 5.7% abv. Appearance: Pours a fairly translucent amber with a fluffy beige head, that leaves behind a great deal of lacing. Aroma: A beautiful cascade hop nose. Fresh pine and citrus. Some sweet malt as well. Taste: Sweet and bready malt, some nice American hops. Finishes with quick bitterness. Mouthfeel: Full bodied, juciy, average carbonation. Overall: This is one of those hoppy amber ales I like. Very balanced between malt and hops, but still had a nice fresh hoppy punch in the finish.